Tammy Abraham reached twenty for the season and Dominic Solanke netted a hat-trick as we blew away poor Huddersfield. We could almost have scored with every first-half attack but strong goalkeeping and bad luck kept the score to 4-1 at the break. The second was crowned by Solanke’s hat-trick goal and finished by the best strike of the night as Kasey Palmer arrowed one into the top corner. Qualified for the last eight of the Premier League international cup. While it is always good for the age groups to have a mix of competition the logic of this trophy is lost on us. With the U19s in the more prestigious Uefa Youth League and all these games being played in England this seems an unnecessary addition. Kasey Palmer will not care as his 35-yard equaliser was even better than his goal in the youth cup yesterday. Kyle Scott scored the second-half winner but Porto were competitive and created chances right up to the final whistle. Bradford City beat Millwall in a fiery replay 4-0 but with brawls and sendings off and chaos. The result means there will be nobody hiding round the corner when you walk home a week on Saturday. On the same day he is contesting the charge here he has been named Portuguese coach of the century in his homeland. Fernando Torres made a bit of an impact tonight scoring two goals for Atletico away to Real Madrid to book their place in the final of the Spanish cup. Blackpool signed Islam Feruz until the end of the season. Poor Blackpool have had a chaotic life this season and it would be fitting for Islam to bring them a bit of joy. He had his own ups and downs in Crete on loan for the first half of the season. A couple of weeks on the training ground really brought out the best in this squad, as many bandied the term perfect to describe our first-half performance. What should have been a stern test evaporated in the first 50 seconds as a loose pass fell to Oscar who advanced and thumped home from the edge of the area. 0-1. Swansea’s only chance of the game followed as the man guilty of the loose pass, Gylfi Sigurdsson clipped the angle of post and bar with Cech stranded. It was their only blip. 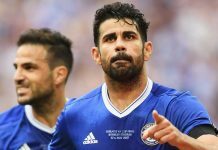 Diego Costa proved his worth finishing a flowing team move, 0-2, and then picking up a loose back pass and firing home. 0-3. Oscar quickly ran on to Costa’s cutback to fire in for 0-4 and the away end was rocking and licking its lips for the second period. In between the goals and the half there was time for the luckless Willian to thunder the ball off the woodwork on a couple of occasions when he could have scored. It was clear that we have been working on squaring the ball for easy finishes all week as Andre Schürrle strode on to Ivanovic’s pass after another incisive team move. Oscar, just behind the German and ready to tap in himself, looked to the skies in being denied his hat-trick. 0-5. Earlier Oscar teed himself up for an outside of the right boot, curling drive that flew a centimetre past the upright. Jose purred afterwards about the time he has had to work in training and with the semi-finals starting this week it is hard not to conclude that leaving the league cup to the U21 side would free up the first-team squad for more pressing matters. The win takes us five points clear at the top and hoping for a favour from Arsenal. You could waste a lot of your life waiting for the Gooners to beat a top five rival, but it does have to happen one day – doesn’t it? Over in Equatorial Guinea Bertrand Traore and Burkina Faso were beaten 0-2 by Congo. Bertrand had a couple of powerful efforts saved. Well what do you know, after years watching Arsène Wenger fling his cavaliers into reckless battle Arsenal beat Manchester City by defending well, having cover in midfield and nicking a couple on the break. It is, apparently, rocket science and gives the lie to all of those in the game who say that laymen cannot possibly understand because we haven’t played at the highest level.